Climate Interactive Co-Directors Beth Sawin and Drew Jones will be giving an interactive presentation tomorrow, March 12th, at Oxford Universtiy’s Saïd Business School on our global energy model En-ROADS. The Earth’s climate and society’s energy infrastructure are each complex dynamical systems driven by multiple feedback processes, accumulations, time delays and nonlinearities, but research shows poor understanding of these processes is widespread, even among highly educated people with strong technical backgrounds. Existing climate and energy models are opaque to policymakers and too slow to be effective either in the fast-paced context of policymaking or as learning environments to help improve people’s understanding of climate dynamics. In this interactive session we will together run experiments in En-ROADS (Energy-Rapid Overview And Decision Support), a transparent, intuitive policy simulation model developed by Climate Interactive and MIT Sloan that provides policymakers, negotiators, educators, businesses, the media, and the public with the ability to explore, for themselves, the likely consequences of energy, GDP, land use, and GHG emissions policies. The model runs on an ordinary laptop in a fraction of a second, offers an intuitive interface and has been carefully grounded in the best available science. We describe the need for such tools, the structure of the model, and calibration to climate data and state of the art general circulation models. En-ROADS is an extension of C-ROADS, the climate simulator that is being used by officials and policymakers in key UNFCCC parties, including the United States, China and the United Nations. Climate Interactive is a U.S.-based not-for-profit organization that helps people see what works to address climate change and related issues like energy, water, food, and disaster risk reduction. Climate Interactive employs system dynamics modeling, which was invented at MIT Sloan in the 1950s. 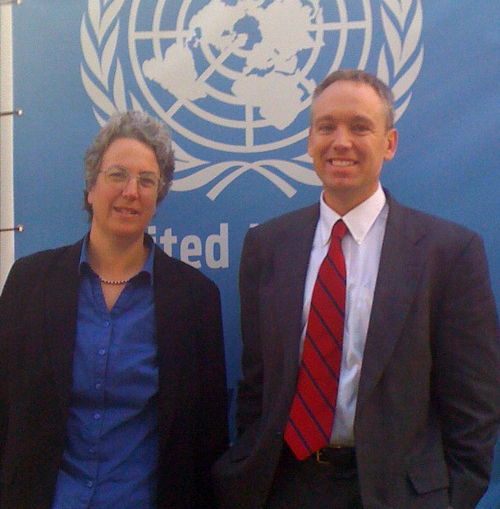 Sawin and Jones are co-founders and co-directors of Climate Interactive. Both hold their degrees from Dartmouth College and MIT.